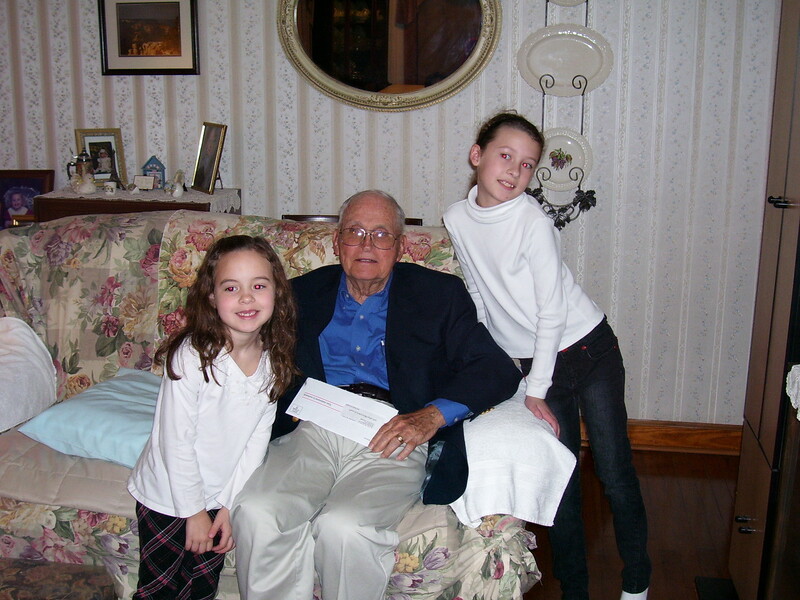 My Dad and two of his great-grandchildren, Maggie and Vivian. Happy Birthday, Dad! 16But Peter kept on knocking, and when they opened the door and saw him, they were astonished.17Peter motioned with his hand for them to be quiet and described how the Lord had brought him out of prison. “Tell James and the brothers about this,” he said, and then he left for another place. In the story we have just read today, we get a glimpse into the ministry of angels. After the birth of the church on the day of Pentecost where 3,000 believed and were added that day, the church began to grow and spread. At first this movement of Jesus followers was an insignificant number. Even 3,000 who became Christ followers at Pentecost were a drop in the population bucket of Jerusalem, where it is estimated population of about 600,000, swelled to over 1-million for the Feasts of Passover followed 50-days later by the Feast of Pentecost. So, even 3,000, while a large number, was less than one-half of one percent of the normal population, and even less if the population is double or triple that. But, as the church grew, they attracted attention. And, they attracted attention, not just because of the increasing numbers of people who were joining the early Christians, but because of the demonstrations of God’s power that accompanied them. “Look at us,” Peter commands the beggar. The man looks at Peter and John. “Silver and gold have I none, but what I have I give you. In the name of Jesus of Nazareth, stand up and walk.” And with that the beggar was healed. Peter goes on to preach in the courts of the Temple, and incurs the wrath of the Sadduccees, because they do not believe in the resurrection. And on it goes, with the church coming under increasing persecution by the religious leaders. — In Acts 5 the apostles heal many, are arrested, and put in prison. An angel of God comes to them in prison, opens the prison doors, and tells them to go stand in the Temple and preach the message of Christ. — In Acts 6, the forerunners of deacons are chosen, and Stephen is among them. Not long after that, Stephen is arrested, brought before the Council of religious leaders. Stephen gives an account of his faith, and the chief priest and religious leaders become enraged, drag Stephen out of the city, and stone him to death. A young man named Saul approves of Stephen’s killing. — In Acts 8, Saul takes a more direct and active role in persecuting Christians. — In Acts 9, Saul is converted, he himself escapes from Jewish attempts to kill him. — In Acts 10 thru 11, the gospel message is taken to a non-Jew, Cornelius, and Peter understands that the gospel is for all people. — In Acts 12, King Herod, not the same King Herod who tried to kill Jesus, has James the brother of John killed. Seeing that the people liked this, Herod had Peter arrested and imprisoned, and is obviously planning to kill him, too. So, we’ve already seen an angel open prison doors once, but we are about to see it again. As Peter languishes in prison, the church prays. Peter is bound by two chains between two guards, so the possibility of escape is remote, if not altogether unthinkable. 7Suddenly an angel of the Lord appeared and a light shone in the cell. He struck Peter on the side and woke him up. “Quick, get up!” he said, and the chains fell off Peter’s wrists. Now, not only is Peter chained between two guards, but other guards are blocking the prison door. But that door opens by itself, and the angel leads Peter one block down the street before disappearing. Peter realizes that this is no dream, and finds his way to the house where the others wait, praying for him. Talk about answers to prayer! Peter is outside knocking on the door, while the band of believers is inside praying for his release. No remember, lots of folks are inside praying for Peter’s release. But rather than believe her, they tell her,”It’s not Peter, maybe it’s his angel.” Which provides an interesting insight into their idea that an angel might be able to assume the appearance and speech of a human being. Nevertheless, Peter continues knocking, and finally the open the door and let him in. Now, we could talk about expecting answers to prayer when we pray, because obviously these folks didn’t, but that’s not my point today. My point is an angel of God came to Peter in his cell, make the chains fall from his wrists, led him past two sets of guards, miraculously opened the prison gate, led Peter down the street for a block, and then disappeared. Even Peter wasn’t sure his experience was real, until the angel vanished. I’ve told that long story to remind us that angels not only bring messages from God, but that they themselves are actively engaged in helping those messages get carried out. Several Old Testament examples come to mind of this dual messenger and warrior role. The first example is a rather sad one. When Adam and Eve are expelled from the Garden, God places an angel — cherubim to be specific — with a flaming sword that turned, to guard the way to the Tree of Life. So, the first instance of the warrior angel was not to do battle on behalf of God’s people, but on behalf of God, keeping Adam and Eve from returning to the Garden of Eden. There are examples of angels appearing to Abraham and Sarah, and even to Hagar, Sarah’s handmaid. But these appearances fit more the idea of messenger, and not warrior. But by the time we get to the Exodus experience, God does use an angel as a warrior. After Pharaoh and the Egyptians refuse to let God’s people go, God sends the angel of death to kill the firstborn of every household. Only in the Hebrew homes, where the blood of the lamb is spread over the door, are the firstborn children spared. But there are other accounts of angels fighting for God’s people. In 2 Kings 19:35, the angel of the Lord — one angel — puts to death 185,000 Assyrian warriors, making it possible for God’s army to be victorious. Next week, we’re going to look at accounts in both Old and New Testaments of how God uses angels to care for all of God’s creation, and people especially. But, there are also instances in the New Testament of God’s angels acting in an adversarial role, a warrior role, to defend and advance the Kingdom of God. 4Therefore, among God’s churches we boast about your perseverance and faith in all the persecutions and trials you are enduring.5All this is evidence that God’s judgment is right, and as a result you will be counted worthy of the kingdom of God, for which you are suffering. 6God is just: He will pay back trouble to those who trouble you 7and give relief to you who are troubled, and to us as well. This will happen when the Lord Jesus is revealed from heaven in blazing fire with his powerful angels. The Book of Revelation is filled with the most descriptive imagery of angels as God’s warriors, but I want to leave that book for the week when we deal with angels and the end of time. Jude’s point is to speak of the humility and restraint of even an archangel, but of course, we are very curious about what this brief verse means. You remember that Moses died in the presence of God, and God buried him. In Deutoronomy 34, the death of Moses is presented. The Bible only says that Moses died and was buried, and that no one knows where his tomb is. But, there must have been some dispute, some struggle between Satan and Michael over the body of Moses before its burial, and undoubtedly Michael wins. Paul suggests that “our struggle is not against flesh and blood, but against the rulers, against the authorities, against the powers of this dark world and against the spiritual forces of evil in the heavenly realms.” That is a battle that started long before man was created, and continues to this day. It is a battle for which we are ill-equipped, unless the scale is tipped in our behalf by the Holy Spirit, our own obedience, and God’s holy angels. Down through the years, fantastic stories of angels fighting real battles have been told. The most famous of these in modern history is the story of the Angels of Mons. The story goes that during World War I, the British army was struggling, in retreat actually. But somehow they blundered forward into the small mining town of Mons, France. Two German army corps divisions attacked the British on August 23, 1914. And here’s where the story gets interesting. During the fight, either celestial bowmen led by St. George, or angels themselves, routed the Germans, allowing the British to safely retreat later. The story had so much support that British historian, A. J. P. Taylor, included the account in his book titled, The First World War, published in 1963. Although the story has been largely discounted, it remains a popular legend concerning angels. But, Jesus reminds us that his kingdom is not of this world. I am sure that implies that whatever battles he sends his angels to fight for us are battles that concern eternity, not politics. Peter’s experience, and the experience of the early church, was that the power of God was evident in their preaching, their ministry, and their protection. God will send his angels. This article first appeared in Outreach magazine in July/August 2009, in my Small Church, Big Idea column. When the doorbell rang at Cradock Baptist Church not long ago, the staff buzzed in a man who announced, “I’m Mike, and I’m homeless. I heard you help people here.” With that, Pastor Rob Edwards knew his small church again had become a vibrant witness to its struggling community. Cradock Baptist Church was founded 90-years ago in the Portsmouth, Virginia community of Cradock, the first planned community in America. In 1918, the U. S. Housing Corporation built Cradock to provide housing for shipyard workers. Today Cradock’s high-density, urban culture reflects typical big city problems of low income, high unemployment, and struggling families. Like many churches of its era, Cradock Baptist Church has large buildings, declining membership, and an aging congregation. But Pastor Rob Edwards has led his congregation in new ministries to their multi-ethnic neighborhood, and in the process the church has benefited, too. Historically, the church has reached out to those with special needs. The Robin Class has taught the developmentally-challenged for over 40-years. Pastor Rob has built on that concern for others, leading the church to reach out to its neighborhood. This summer 250 volunteers from World Changers, Southern Baptists’ volunteer workforce, will rehabilitate homes in the community. A partnership with the city and a grant from HUD for materials will enable the church to help revive its historic neighborhoods. That’s just the beginning. Pastor Rob envisions hiring a housing counselor to help prevent foreclosures among the financially-struggling. One program, however, really kicked the church’s community engagement into high gear: a coop food ministry where combined ordering doubles a family’s grocery purchasing power. At their last food distribution, over 1,000 families received 27,000-pounds of food, with the help of 50 volunteers from eight different congregations. Spotlighting established ministries. The Robin Class for the developmentally-challenged joins the congregation for worship frequently, giving higher visibility to this longstanding ministry. Touching people during the week. Alcoholics Anonymous and other 12-step programs meet in the church 7-days a week. In turn, the church and staff have gotten to know many by name, caring for them in times of grief, and sharing in their moments of joy. Believing community renewal creates church renewal. By banding together to help revitalize the community through housing projects, feeding programs, school supply give-aways, and weekday ministries, church members found a new sense of mission. Creating new worship experiences. The church retains its traditional worship at 11 AM on Sunday morning, but voted unanimously to create casual worship at 5 PM on Sunday evenings to reach their younger, unchurched neighbors. Special, one-time events also have drawn neighbors together at block parties, and musical presentations. Celebrating the church’s weekday ministries on Sundays. While Sunday morning worship attendance hasn’t grown much, Sundays have become the celebration for what the church is doing during the week. Today Cradock Baptist’s small Sunday morning crowd of 60 touches the lives of hundreds each week. One family called asking for prayer recently. “We’re one of your food box families,” they said. “Please pray for us.” To many of these unchurched families, Pastor Rob is their pastor, and Cradock Baptist Church is the only church they know. In the process, the church’s spirit has been revived and their reputation in the community changed. Now people in Cradock know when they need help, one small church won’t turn them away. Tom Friedman, author of The World is Flat and New York Times columnist, is big on China, but he’s not the only one. The 21st century is being called the “China Century” as China’s economy is predicted to grow to three times the size of the US economy by 2040, only 30 years from now. One book, When China Rules The World, foresees drastic cultural and political changes as China rises in world status. What does this have to do with churches? Just this — young people, including Chinese young people, are already exerting tremendous social pressure on the global culture. 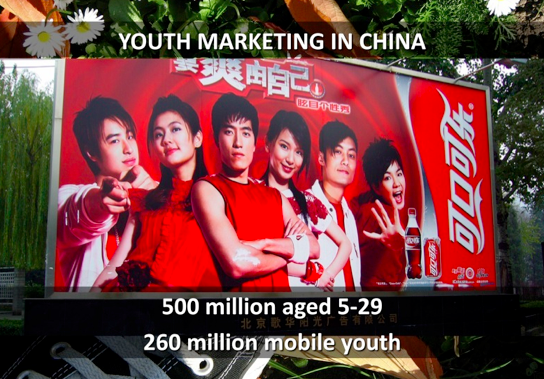 Trends in China’s emerging generation are both reflecting and influencing the world youth culture. I track several emerging gen sites and blogs, and Chinese trends are appearing more often. One site, enoVate, belongs to the company by the same name. Headquartered in Shanghai, China, enoVate’s mission is “insights and creative solutions for China’s youth market.” But look at their client page — Coca-Cola, Sprite, New Balance, Kraft, Unilever, Ticketmaster, and assorted other American and European corporations. All of them are trying to expand their reach in the world’s largest youth market by understanding what makes Chinese youth tick. A recent post on enoVate’s blog posed a provocative idea — ‘”I Want A Mixed-Race Baby”: Are Chinese Youth After a Mixed-Race Baby?’ The combination of Chinese features, augmented by those of another race, are seen as both exotic and desirable among Chinese youth. The previously insular Chinese society has not only adopted the racial pluralism of the United States (we have a mixed race president now), but has given racial pluralism an uniquely Chinese twist, which is what China tends to do with any trend they adopt. My point in this is not to build an airtight case for the rise of China, but to suggest that we tend to look only within ourselves and our own culture for insights into how to do church. But there are other models that are taking a broader, more global view. One example is Newsong church, with its international locations in California, India, London, Bangkok, Mexico City, and the other parts of the US, which has styled itself as a “third culture” church. More churches will follow Newsong’s lead, and if you have traveled in Asia as I have, you recognize that China dominates the landscape. With increasing global communication, world travel, and social networking, we need to pay attention to the trends driving China. Because, to paraphrase Hollywood, these are coming soon to a community near you. Breaking News: After I posted this article on Jan 20, the Jan 21 edition of the New York Times carried this headline and article — Foreign Languages Fade in Class – Except Chinese. It appears that while other language subjects are declining, the teaching of Chinese in public and private schools is increasing, partially because China is paying the salaries of teachers to travel from China to teach in the US. Remember when all Chinese wanted to learn English? Interesting. Scriptures on Scopes: Bible Abuse or Silent Witness? UPDATE: According to various news reports yesterday, January 21, 2010, Trijicon will stop imprinting Bible references onto their scopes, and will offer the US govt and other govts kits to remove the existing Bible references on scopes already purchased. ABC News broke an unusual story using unusual language today. A military rifle scope supplier, Trijicon, embeds Bible references as part of the serial numbers molded into its scopes. ABC News labeled these Bible references as “secret Jesus Bible codes,” which I suppose sounds a lot more mysterious and “DaVinci Code-like” than just calling them scripture references. 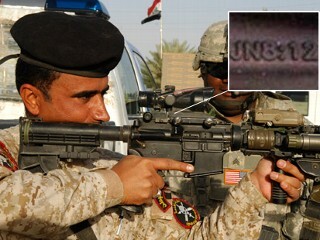 ABC provided several photos where scripture references like JN8:12 are clearly visible on the product supplied to the US Department of Defense by Trijicon. The company was recently awarded a $600-million contract to provide 800,000 scopes to US troops. Concerns that the use of scopes bearing the imprint of Christian scripture references will further the idea that America is on a Christian crusade against Muslims prompted the action of the Military Religious Freedom Foundation exposing the cryptic references. Some believe that Al Qaeda and other radical Islamic groups will use seized rifles and scopes as recruiting propaganda. Is this an ethical issue? Should the US military, which denied that it knew of the scripture references, purchase weaponry encoded with Bible references? Is this a violation of church-and-state separation? Does this use of the Bible by Trijicon amount to Bible abuse? Should Scripture references be used on weapons of any type, including hunting, law enforcement and military weaponry? How do we reconcile the Christian message of peace with a delivery system designed for war? Or, is the company right? Are these references their own legal witness to their faith and biblical principles? I’d be interested to hear what you think. On November 1, 1755, a devastating earthquake hit the city of Lisboa, then called Lisbon, Portugal. Tremendous waves crashed ashore, and gigantic fires broke out throughout the city. Nine thousand buildings were destroyed, along with priceless works of art, books, and historic records of Portugal’s explorations in the New World. Out of a population of 275,000 people, almost 15,000 were killed. According to Dr. Paul Schilling, many died in churches where they had gathered for All Saints’ Day services. 4. a lax moral code in Portugese society. So this week, when Pat Robertson, founder of the Christian Broadcasting Network, inferred that the earthquake which struck Haiti on Wednesday was somehow connected to a legendary pact the Haitians had made with the devil, he was following in the verbal tradition of others who have sought explanations, and tried to fix blame, for natural disasters which have claimed untold numbers of lives. “I really believe that the pagans, and the abortionists, and the feminists, and the gays and the lesbians who are actively trying to make that an alternative lifestyle, the ACLU, People for the American Way — all of them who have tried to secularize America — I point the finger in their face and say “You helped this happen.” — Jerry Falwell speaking to Pat Robertson, Sep 14, 2001. Falwell would later apologize for this remark by saying that he blamed no one but the individual terrorists involved in the 9/11 attacks. There was no question in their minds that his blindness was the judgment of God, the curse of God, for some sin committed by either the man or his parents. Of course, if the sin is imputed to the blindman himself, then he would have had to sin before he was born, because his blindness is from birth. Or, perhaps they believed that God knew the man was going to sin after his birth, and so God struck him with blindness in anticipation of his sin. Or, his parents might have sinned. They could have been immoral, he might have been conceived in sin, and so God’s judgment strikes their first-born child as God had struck the first-born of the Egyptians 1,500 years before. We seek an explanation for suffering because if we can make sense of it, if we can find a cause for suffering, then we can rest more easily at night. One of the reasons John Wesley offered in his pamphlet titled, Thoughts Occasioned by the Late Earthquake at Lisbon, was that it was better to attribute the earthquake to God than to think that we were at the mercy of random natural events. We are always trying to make sense of suffering. But in our attempt to make sense of it, there are some things we need to understand. The first truth we need to understand as we seek to understand the problem of human suffering is that God’s thoughts are not ours and God’s ways are not our ways. These are God’s thoughts. Thoughts of redemption, of promise, of love, of faithfulness, of invitation, of hope, of generosity, of forrgiveness. We think God’s thoughts are of punishment and vengeance and retribution. But those are our thoughts, not God’s. God’s highest and greatest thought is always of love. If it is not, then we have no explanation for God’s sending Jesus. God continually reaches out to mankind with the offer of God’s forgiveness, fellowship, and love. We should be very suspicious of those who claim to speak the thoughts of God, especially if those words are words of destruction. The second thing we must understand is that human suffering has many causes. Human suffering and death can be caused by evil, natural events, accident, and human choice. Let’s explore each one of these. 1. Evil. Everything bad that happens is not caused by an evil force. For an event to be attributed to evil, there must be a moral intention. In other words, it is the intent that defines the action. By that definition, the Holocaust was evil. The Nazi regime and Adolf Hitler sought the “final solution” — death — for the problem of the Jews. According to Hitler, the Jews were to blame for everything that was wrong with Germany and the world, and so the final solution was that all the Jews had to die. In the Holocaust, Hitler was able to exterminate 35% of the world’s Jewish population — over 6,000,000 Jews died as a direct result of Hitler’s intention to kill them. That is evil. When someone points a gun at another and pulls the trigger in an effort to take their life, that is evil. When an adult uses his power and authority to abuse an innocent child, that is evil. When a man beats a woman, a soldier tortures a prisoner of war, or the strong take advantage of the weak, that is evil. Evil has an intention to do harm, to take, to hurt, to demean, to rob, to kill. Evil is selfish, loveless, self-centered, ruthless, merciless, and unforgiving. Evil is sin incarnate, rebellion against God’s love, and the attempt to mar the image of God in humanity beyond recognition. By that definition, an earthquake cannot be evil. An earthquake, a tornado, a tsunami, a hurricane — all can cause immense suffering, but in themselves they are not evil events because there is no intention. To attribute to God the use of nature as a means to inflict harm is to attribute to God evil intent. Just as God’s thoughts are not ours, neither are God’s ways. Jesus used the example of the wheat and the tares, the sheep and the goats, to remind us that both the obedient and disobedient will grow up together until the final judgment of God. 2. Natural law and events. God has created an orderly and natural world. We have the law of gravity for instance. We all understand that law — what goes up, must come down. So, if I decide that the law of gravity no longer applies to me, and I walk off the edge of the Grand Canyon, I am going to be in for a really big surprise. Gravity does apply to all of us, equally and unrelentingly. Gravity is a law of the natural world. The same can be said for natural events such as hurricanes, tornadoes, earthquakes, and tsunamis. Scientists understand and can explain the phenomena behind each of these events. When conditions are right, either meteorologically or seismically, we can expect a nature event. We know when hurricane season begins and ends, and we can track tropical depressions each night on the nightly news until they become full-fledged hurricanes when they reach the coast of the United States. Natural laws are at work. An earthquake is a natural event. CNN reported this week, among others, that the island of Hispaniola, which is occupied by the Dominican Republic on the one end, and Haiti on the other, sits over two parallel earth plates which rubbed against each other this week. This was a natural, if not totally predictable, event. Seismologists knew this day would come, they just didn’t know when. I think I told you about my experience in the mild earthquake that hit Kaoshiung, Taiwan when I was there in the late 1990s. The hotel room shook, the door in the bathroom kept banging against the wall, and I jumped out of bed scared out of my wits. I proved that my going to the large plate glass window in my room to look out. Fortunately, the earthquake was relatively mild, although it did make the news in the US, and Debbie tried to call the hotel to check on me. Natural events happen without any intent, but governed by the laws of the natural world that God established at creation. When birds struck the engines of US Airways flight 1549 a year ago this week, the plane lost power. Fortunately, Captain Sully Sullenberger made a safe water landing and all 155 passengers survived the crash. This was an accident — birds and jet engines are not compatible and when some birds accidentally flew into the jet turbines, the result could have been much worse than it was. 4. Human choice. Human choice can involve evil intent, as in Hitler’s case. But human choice can also involve unintended consequences, as in the all-too-familiar cases of drunk drivers who crash their cars into innocent people, and kill or injure them. Drunk drivers do not intend to do evil. They do not intend to kill or injure. But the choice they make to drink to the point of impairment, and then to drive a motor vehicle, results in injury to others. Our society has decided that even if someone does not intend to kill or injure, their choice to drink and drive is a choice for which they are held liable. And so we have laws that punish drunk driving, whether there is death or injury. Our choices matter, and our choices can be the cause of immense human suffering. When parents choose to neglect their children, or to endanger their lives, our society has said that behavior is unacceptable because the potential for harm exists. Our choices can cause human suffering, and newspaper and TV reports each day reflect the choice of a jealous husband to kill his wife; or the choice of a disgruntled employee to wreak havoc in his workplace. Human actions are most often by choice, and that choice is the responsibility of the one who engages in that behavior. When events that inflict tremendous human suffering occur — such as the Haitian earthquake, the southeast Asian tsunami, or the shootings at Virginia Tech — the question invariably is asked, “Where is God?” The answers that come too quickly are ones like Pat Robertson’s. God is said, by some, to be using these events either as punishment or warning, or both. Punishment is usually assigned to those who are suffering in the tragedy, and warning is for those like us who are witnesses to it. In other words, God is the agent behind the earthquake. I would take strong exception to that idea. If God is all good, and all powerful, why did this happen. God either is not all good, and therefore let this happen; or, God is not all-powerful and therefore was powerless to stop it from happening. Both of those ideas of God are based on the notion that God is removed from mankind, and, like a puppeteer in the sky, is pulling certain strings to make things happen, or not happen. But that is not the picture of God we get from either the Old or New Testaments. The portrait of God that is most accurate, and most Biblical is the portrait of God with His people. God hears the cries of His people and He comes down, not literally, but relationally. Down into the suffering, down into the reality of human life. Down to our level of fear and frustration, or sorrow and loss. God comes down to where man knows God is present. Jesus came down — down from being the God of heaven, down from heaven’s glory, down from that position of authority that was rightfully his, down from the blazing glory of Light, down into a human body, down into the limitation of humanity, down to the obedience of sacrifice, down to the most heinous death of all, down to the cross. And we call that the incarnation — God with us, Immanuel. So, God comes to His people, and God’s people encompass all of creation. We are all God’s people, for we are all created in God’s image. We are all God’s children, we are all God’s beloved. Some of us know it, and some do not. Some of us live it, and some do not. But our unfaithfulness does not change God’s faithfulness. God is with us, present in our suffering whether it is in Haiti or New Orleans or Blacksburg, Virginia. “I answer that not only do I not know it, but that I don’t even know if a tragedy of this magnitude has a response. What I do know is that there is “response” in responsibility. When we speak of this era of evil and darkness, so close and yet so distant, “responsibility” is the key word.” –Elie Wiesel, Night, preface xv. When God comes down, when God is present in the suffering of His people, God always invites those who are not suffering to join Him in the work of relieving that suffering. It is not enough for us to watch the news accounts on TV, or to shake our heads in disbelief and sorrow. God joins the Haitians in their suffering, and He invites us to join Him, too. So, in this disaster, we must work. We must pray for those who are being rescued, for those who are injured, for those who have lost everything. We must give out of our own surplus, our own comfort, in order that others might have something. We must respond to this suffering by being responsible for our Haitian brothers and sisters. Believers were killed — the Roman Catholic bishop, a prominent Baptist pastor, the head of the United Methodist relief organization. Kate Snow of ABC News is in Haiti. Her message on Twitter was that she had been to a small church where people were killed. This disaster is not the result of some diabolic legend. This is a natural event. But this natural event becomes the occasion for a supernatural outpouring of God’s love through us, and others, to those suffering in Haiti. The problem of suffering is not solved by finding someone to blame. The problem of suffering can only be alleviated by finding someone to love.